Honey Honey Argyled Quilt Along and Giveaway!! 1 Choice 4 Quilting was so thrilled at the last tutorial we are back with another. A special thank you to Jamie at Busy Bee Quilts for hosting. Be sure to check out the photos on the Flickr Page. If you missed last month, here's the run down: Each month we will link up with a blogger or choose a book to create a myriad of fun projects. From quilts to bags to home decor, it will sure to be a fun time. Our second month we are linking up with Jessica at Quilty Habit to bring you a tutorial for the "Argyled Quilt" using the gorgeous Honey Honey fabric line by Kate Spain for Moda. This is a great quilt and will suit beginners very well and get you in the mood for spring!! I will give away one Arygled Quilt Kit to a lucky winner! Entry information is below! what you would pay if purchased separately and as always it will ship free of charge! Jump over to Jessica's Blog Post for all the details on the tutorial!! by this day for a special PRIZE! This time you can enter up to 10 different ways! WOW that's a lot of chances!! 1. Please leave your first comment by sharing with us....Do you have a Quilty habit? Mine is starting way too many projects at once. When the ideas start coming I can't help myself. I can't wait to read your comments! 2. If you follow my blog (left column under what's new) or you choose to follow my blog, leave another comment letting us know you have. 3. If you choose to Follow me on Twitter or you already do, leave us another comment letting us know you have. We would love it if you would re-tweet our giveaway too :) That would be AWESOME!! Let us know you have for an extra entry. 4. If you are a Facebook follower or you decide to head over to our Facebook page and click on the Like Button (OR use the toolbar below). Then leave us another comment letting us know you have! 5. If you follow me on Pinterest or you decide to head over to my Pinterest page and follow me (OR use the toolbar below). Leave another comment letting us know you have. 6. If you Blog about our giveaway and tell all of your friends, please leave us a comment letting us know you did with the URL of your blog post. We REALLY appreciate our bloggers AND I will email you 5% off coupon!! 7. If you are a follower of Jessica's blog jump over to her blog and comment there. 8. If you decide to become a new follower of her blog leave her a comment. 9. If you blog you can add our button to your blog. You can grab our button here! Then leave us another comment letting us know you have! Interested in the button earning you free fabric, check out our affiliate program. 10. You can also join our Newsletter to receive all the current releases, special discounts and more! Then leave us another comment letting us know you did! We will add all the blog comments up and choose a winner on total entries so if you've entered on the 1 choice 4 quilting blog you don't have to enter again on Jessica's blog and vice versa. We are really looking forward to making this a monthly event and we have some great bloggers, quilters and tutorials lined up. I hope you'll join in the fun!! This giveaway will end Friday 3/1/13 at noon and we will announce the Winner by 4 pm EST on March 1, 2013 so everyone will have plenty of time to order their kit and have it in time for the sew along to begin on 3/6/13. They are shipped priority and will arrive in 2-3 days! May threads of friendship stitch your life!!! If you've shopped with me recently you may have received some Guterman thread with the saying "May threads of friendship stitch your life." I wrote those words to sum up how grateful I am at the friends I making across the miles. The world is vast and full of creative people. Some quilt, other sew clothes, design bags and still other crochet, knit or scrapbook. Some have full time jobs, others are stay at home moms or have retired from one or both. As you look across a crowd you'd never know who is who. Each brings a unique idea, characteristic or skill to light. And what brings all these people together? The joy of their craft and the wide world of social networking. As I continue to build 1 Choice 4 Quilting I am amazed at all the new friends I've made through the process. The avenues of Facebook, Twitter, Google+, Pinterest or this blog that you are reading here create connections that years back would have never been possible. I always love the comments you write and greatly enjoy the emails I receive from happy customers telling me how much they love shopping at my store and the ones that share their beautiful work. From the beginning I was blessed to come in contact with Jacqueline. She and I have had some great conversations and hope to meet up at the Quilt Market in Portland this spring. Jacqueline is a fantastic lady raising two beautiful children and she makes absolutely gorgeous bags see her blog post: A Bright Sunshiney Day. She is on board to do a future tutorial for us using a bag we choose from a book called "Bags" by Sue Kim. She has a new blog call "From out of the Chaos" where she shares her life and her skills. I invite you to jump over to Jacqueline's blog and read. She is running a giveaway for a charm pack from 1 Choice 4 Quilting. She is also promising a bonus gift and I know it will not disappoint. Jump over to her blog by clicking here, enter, share with your friends and have a wonderful week! I thank you for being a friend, new, old or future. I am thankful to have you in my life!! Can you believe it's already week 3? How did it go? Did you discover any new techniques? Are you super excited to put all of your squares together? Jamie did a wonderful job with her instructions and it was great to follow along. I can't thank her enough for the hard work she did to share this tutorial with all of us! As I previously mentioned, feel free to ask questions, make comments and share pictures of your progress on the 1 Choice 4 Quilting Club Flickr Page. Post pictures of your quilt top to be entered into the drawing for the next quilt along beginning March 4th with Jessica from Quilty Habit. 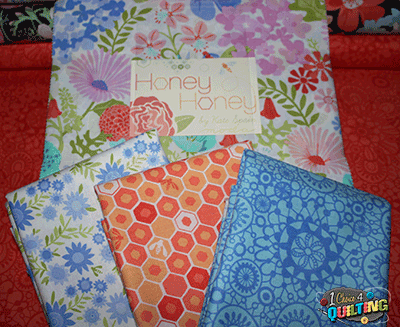 The next series will feature a quilt kit using Honey, Honey by Kate Spain for Moda. Click here for Week 3 of the Easy as Pie Quilt Tutorial! Interested in this kit or the next one? Visit the Quilt Kit Page at 1 Choice 4 Quilting for this quilt kit and many others! How are things going after week 1? How is your quilt coming along? Are you geared up for week two of this awesome quilt along? Jamie's instructions are wonderful and so easy to follow. I can't thank her enough for the hard work she did to share this tutorial with all of us! As I mentioned last week, feel free to ask questions, make comments and share pictures of your progress on the 1 Choice 4 Quilting Club Flickr Page. Click here for Week 2 of the Easy as Pie Quilt Tutorial! Still need a kit? Visit the Quilt Kit Page at 1 Choice 4 Quilting for this quilt kit and many others! How exciting is it to be starting our quilt-a-long. Here is how this will work. Each Monday I will post the link to that weeks tutorial. You can get all the instructions that you will need. Feel free to ask questions, make comments and share pictures of your progress on the 1 Choice 4 Quilting Club Flickr Page. This is going to be an exciting journey and I am so glad you have decided to participate! Click here for Week 1 of the Easy as Pie Quilt Tutorial! Still need a kit? Visit the Quilt Kit Page at 1 Choice 4 Quilting for this kit and many others!